Melanie Dekker @ ONO, Berne - Monday, 19 March 2012. 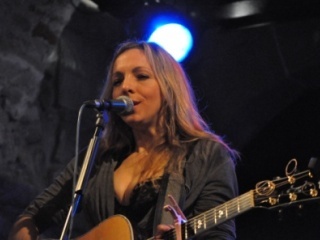 Melanie Dekker, singer/songwriter from Vancouver, made a stop in Berne and sang for an intimate audience @ Kulturkeller ONO. She brought along her country fellow Allan Rodger (bass, harmony vocals) and the German Keyboarder Sven Rowoldt. Mostly she presented her new album "Here & now" with songs like "Rich boy", "Saturday night show" or "Lullaby", but she also played some songs I already knew from her former CDs. In 2006 she wrote "Haven't even kissed you yet" and with her warm and powerful voice she kept flirting with the audience. Another song from "Revealed" was one of the highlights of the evening: Rodger's pulsating bass lines set the pace for Melanie's breathtaking singing on "This song". Two years later she took her fans on an "Acoustic Ride" with "We're the angels", a mesmerizing rhythmic ballad, or "Meant to be", a melancholic Americana, perfect for Melanie's "Creamy Cappuccino" voice. "Wishful thinking" was another favourite of mine, great singing and brilliant music. Melanie even answered my spontaneous request for a Blues as an encore with the "Life by drop Blues", a solo performance on guitar, excellent. Not only Melanie Dekker is a brilliant singer/songwriter with a hauntingly beautiful voice, she is also a very attractive woman and she looked gorgeous this evening, a delightful Monday evening in Berne, cheers! Photo Credits: (1) Melanie Dekker (by Adolf „gorhand“ Goriup).